SGM ball mill is a key equipment to grind the crushed materials, and is widely used in powder-making production line including cement, silicate, new-type building material, refractory material, fertilizer, ore dressing of ferrous metal and non-ferrous metal, glass ceramics, etc, and the ball mill can grind various ores and other materials with dry type and wet type. There are two kinds of ball mill, grate type and overfall type due to different ways of discharging material. The ball millis a horizontal rotating device transmitted by the outer gear. The materials are transferred to the grinding chamber through the quill shaft uniformly. There are ladder liner and ripple liner and different specifications of steel balls in the chamber. The centrifugal force caused by rotation of barrel brings the steel balls to a certain height and impact and grind the materials. The ground materials are discharged through the discharging board thus the grinding process is finished. 2. 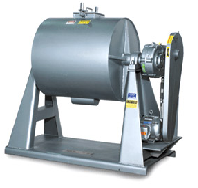 Grinding jars with volumes from 1 ltr- 2 ltrs- 5 ltrs& 10 ltrs. 3. suitable for long-term trials and continuous use. 4. reproducible results due to energy and speed control (optional).